David Cameron is a well known Toff. In England Toff is the official word to describe rich, arrogant, privately educated, right wing, mildly inbred scroungers. Toffs can be easily identified by their ridiculous accents, their boorish arrogance, their extreme right-wing views, their self righteous refusal to partake in manual labour and their preference for ridiculous headwear. There are many necessary aspects to true Toffdom, the Toff must be born to a wealthy land-owning family with aristocratic blood. They must be educated at private school and if they are intelligent enough to attend university they must go to either Oxford or Cambridge. 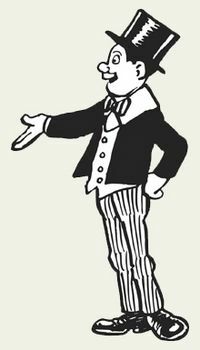 Toffs are taught from an early age that they are superior to the ordinary people that must be treated with suspicion and contempt. They are also taught that due to their superiority to the lower classes they are exempt from having to work for a living. Toffs hate "new money", they find it disgusting that ordinary people can obtain the same levels of wealth, power and influence as them through amassing money earned through labour. To a Toff, the only true wealth is inherited wealth. If you were not given your land and money by daddy and worked to obtain it instead you have cheated and cannot be considered a true Toff. Toffs can easily be identified by their preference for stupid hats. As Toffs do not have to work for a living they have a lot of free time to spend on their hobbies. Toffs love blood sports, to a toff there is nothing better than getting together with a load of other Toffs to brutally kill a load of animals. Toff blood sport events generally go on for several days as they have plenty of time to fill due to their aversion to work. The most common toff blood sports are fox hunting and grouse shooting. Toffs always have time to attend posh events while the rest of the country are busy working for a living. 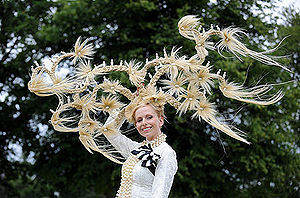 Toff events include the Royal Ascot Hat Show, the Chelsea Flower Show, County cricket and numerous Royal events. Casual racism is one of the Toffs favourite pastimes. The aim of casual racism is to say outrageously bigoted and racist things but in such a posh accent that ordinary people are too taken aback to challenge them about it. The Duke of Edinburgh Prince Philip is the undisputed master of casual racism. Virtually every utterance the man makes is tinged with bigoted and racist sentiment. The Toffs own their own political party in England called the Conservative Party. It works exclusively in the interests of the super rich elite and has the motto Take from the poor and give to the rich. The party has traditionally been led by Toffs such as The Duke of Wellington, The Earl of Beaconsfield and The Marquess of Granby. In recent years the party have bribed people from working class backgrounds such as Margaret Thatcher and John Major to betray their fellow countrymen and work in the interests of the establishment elite in return for some filthy lucre. This ruse was good enough to fool the British people into thinking that the Tories were more than just Toffs for 18 years, but they eventually cottoned on, so the Tories dropped the pretence and returned to traditional Toff leadership with the selection of David Cameron. Toffs are notoriously unpatriotic. They will do anything against their own country's interests in order to protect their own. Toffs like Lord Ashcroft avoid paying millions of pounds in tax by pretending to be from Belieze. Ashcroft then spends most of what he saves on his tax bill funding the Conservative Party to work against the interests of the working people of Britain in order to divert even more wealth to Toffs. 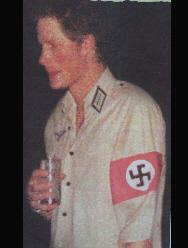 Prince Harry pays tribute to his family's proud Nazi heritage. The Queen Mother: Said that she would be happy for the Nazis to take over Britain as long as they kept the Royal Family. Edward VIII: Strived tirelessly to improve Anglo-Nazi relations. Lord Haw-Haw: Propagandist for Nazi Germany. Sir Oswald Ernald Mosley, 6th Baronet: Founder of the British Union of Fascists in the 1930s. Lord Rothsmere: Turned the Daily Mail into the fascist propaganda machine it has remained until present.